Courtroom Sketches Prints: $30 for 8x10", $45 for 11x14" giclee on paper. $90 for 11x14" canvas (a popular seller). $ 150 for 12x16-14x18 canvas. $200 for 16X20" canvas. Canvas prints are wrapped on artists' stretcher bars, archival, and UV protected, ready to hang. Published courtroom sketches $400 and up. Shipping/handling, taxes may apply. Free delivery to the downtown courthouses. Military Discount 30% on commissions. Fine Art Prints: $200 12x16". Larger sizes quoted. Commissioned Court Sketches:$1300 for 20x26" (see details below). To purchase a sketch on this website, make a note of the date or title and contact me. I will send you payment options in an email. Commissions of courtroom sketches are done onsite and refined in the studio with source photos. The sketch will include all the elements of a journalistic courtroom illustration. The painting will have you more prominently portrayed in the drawing, may contain pertinent evidence or witnesses as you prescribe. San Diego courtrooms 20x26" $1300. Outside San Diego County $2000. Illustration of courtroom drama done to your specifications. Prices particular to your project. 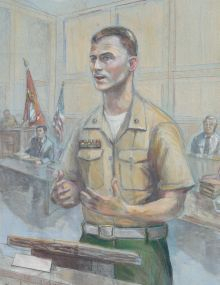 Use of archive courtroom sketches email for price quote. Contact here. All images on this website can be ordered as prints. 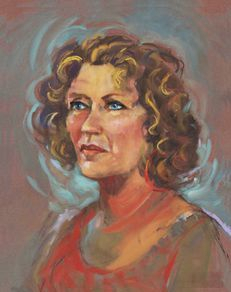 Formal Portraits in Oil or Pastel $900 for 16x20" (head). $1500 for 18x24" Larger work prices quoted. There will be photo/sketch sessions required. Memorial Garden Stones $500 (see sample at right). 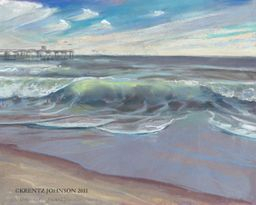 Starting at $400, these paintings in colored pencil, gouache, charcoal, ink or pastel can be a dramatization of your affidavit, an illustration for a story, novel or lecture. Free conversion to digital media of your preference. 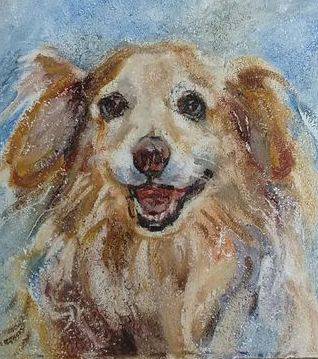 Formal Portrait sample below is Pastel 18x24"
Memorial Garden Stone is painted with Oil, then treated with UV sealant for protection from weather and sunlight. Sample shown is 14x14" oil on patio stone. Fine Art Images are available as prints. Original art is available only in person, by appointment. For Exhibits see Events Page.